Length: 260mm. Image shows painted and assembled kit. 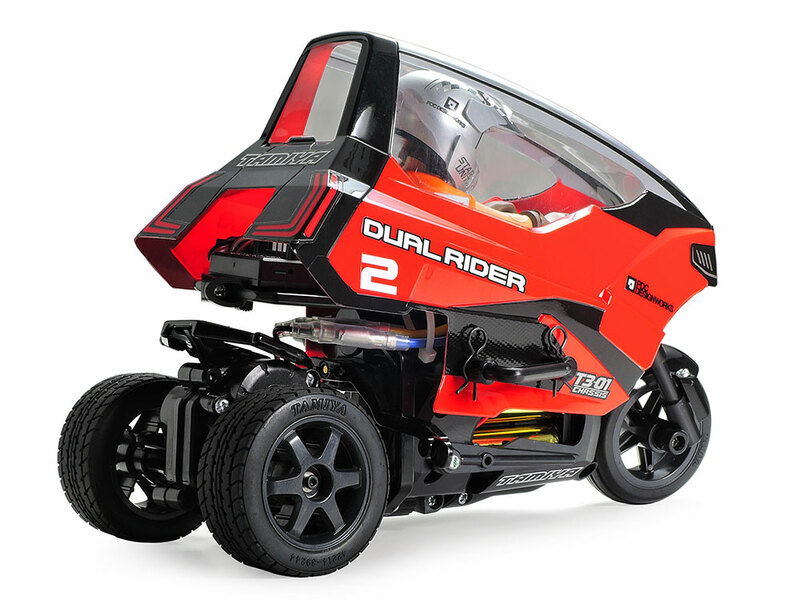 This R/C model assembly kit creates the Dual Rider, a fun 3-wheeled model with a futuristic Takayuki Yamazaki-designed body featuring a prominent overarching canopy. 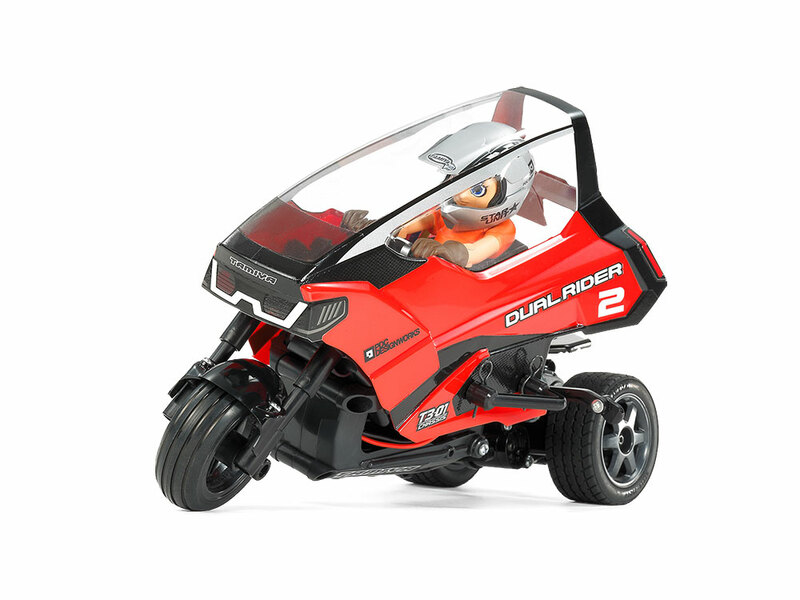 It is molded in lightweight polycarbonate. 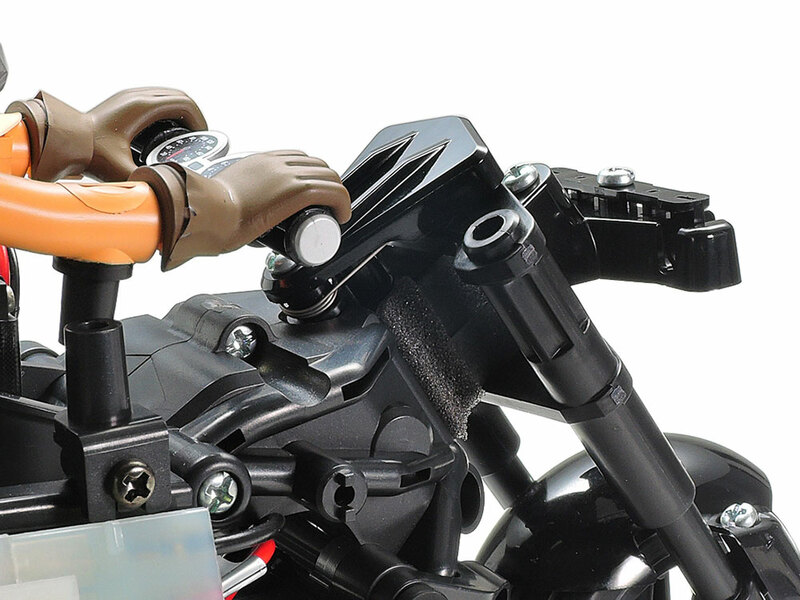 The included driver figure offers numerous arm positions and headgear options, while separately sold LEDs can be used for the headlight. ★A futuristic, sweeping canopy is one highlight of the polycarbonate body designed by Takayuki Yamazaki. 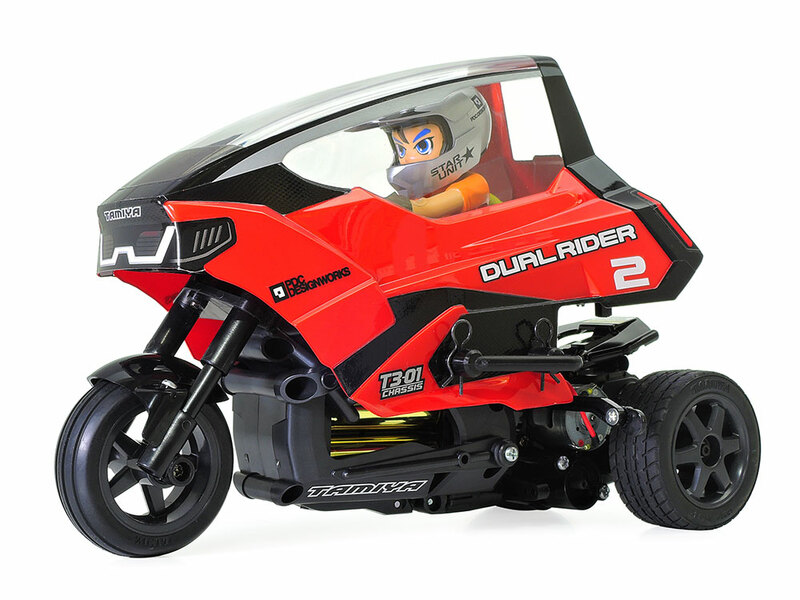 ★A look at the rear end of the model showcases the unique "chopped-off" style employed on the Dual Rider. 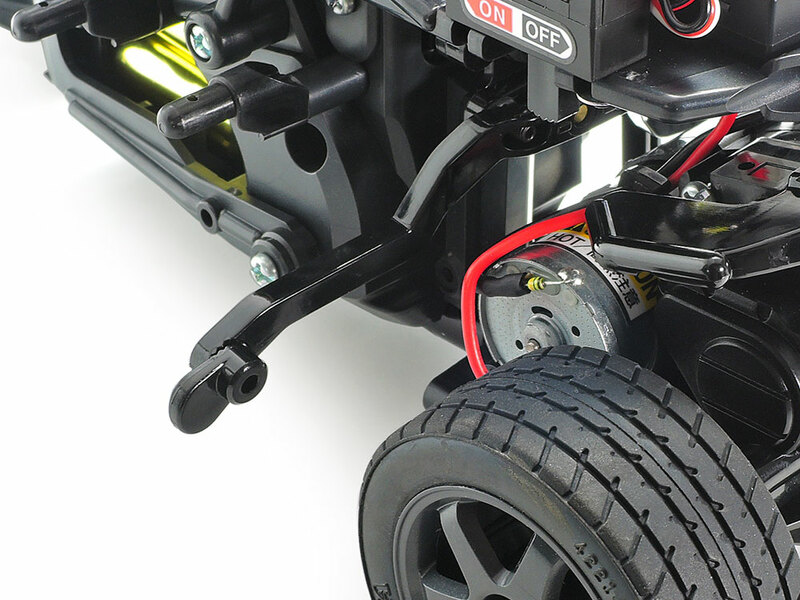 ★T3-01 chassis is comprised of front (with R/C equipment and power source) and rear (motor, gearbox) sections. 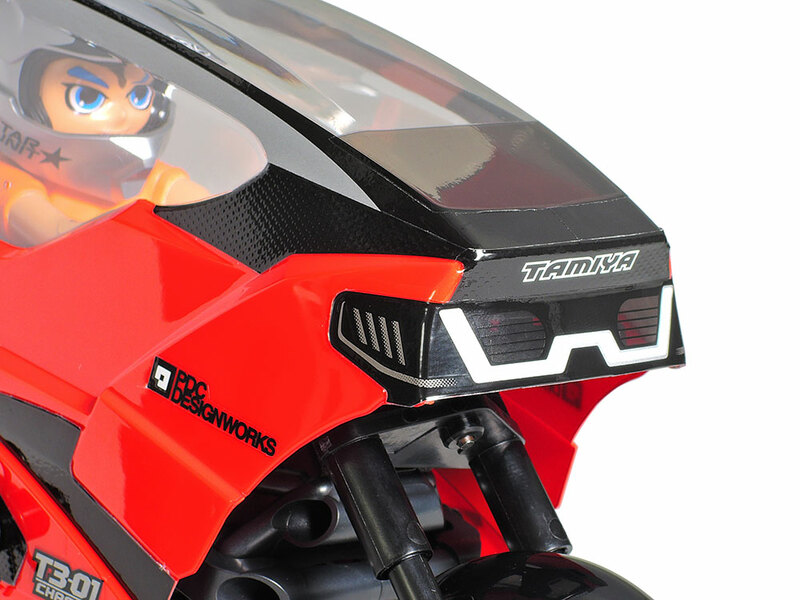 ★The headlight design features a digital motif that also provides the front with a futuristic air. 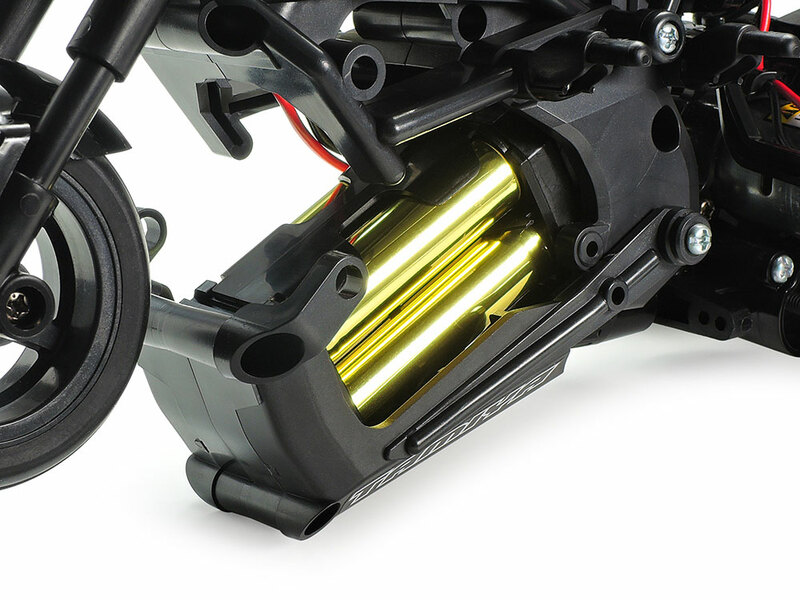 ★Attaching light housing component to the front fork allows installation of separately sold LEDs. 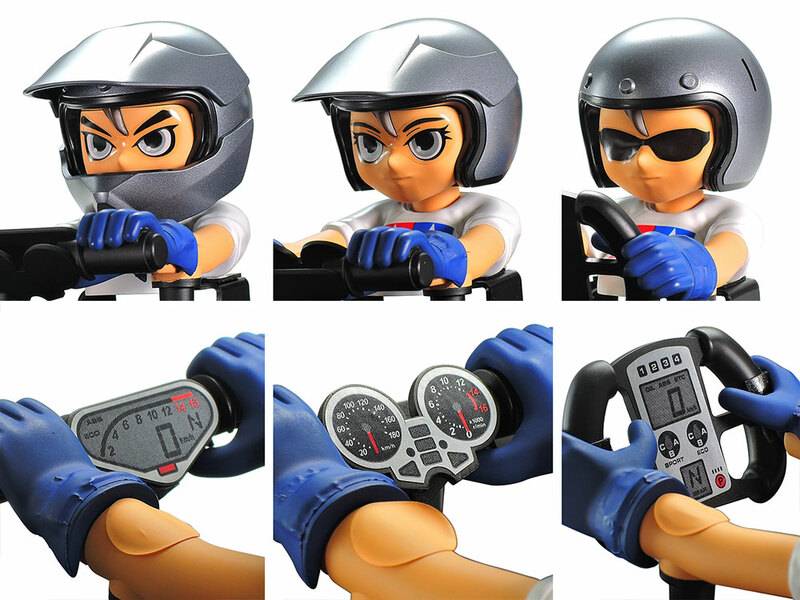 ★A close-up on the T-shirted driver figure, who was also designed by Takayuki Yamazaki. 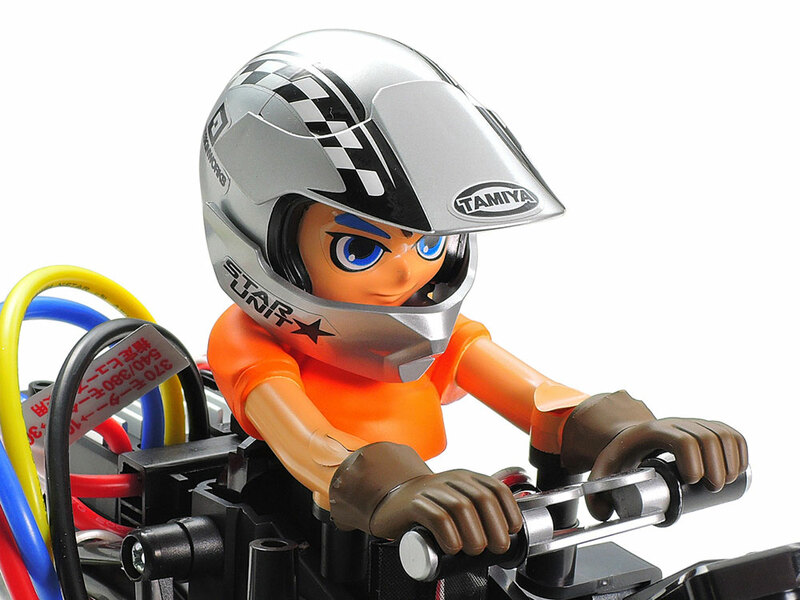 ★Options abound, with a selection of helmet styles, eye stickers, instrumentation and more! 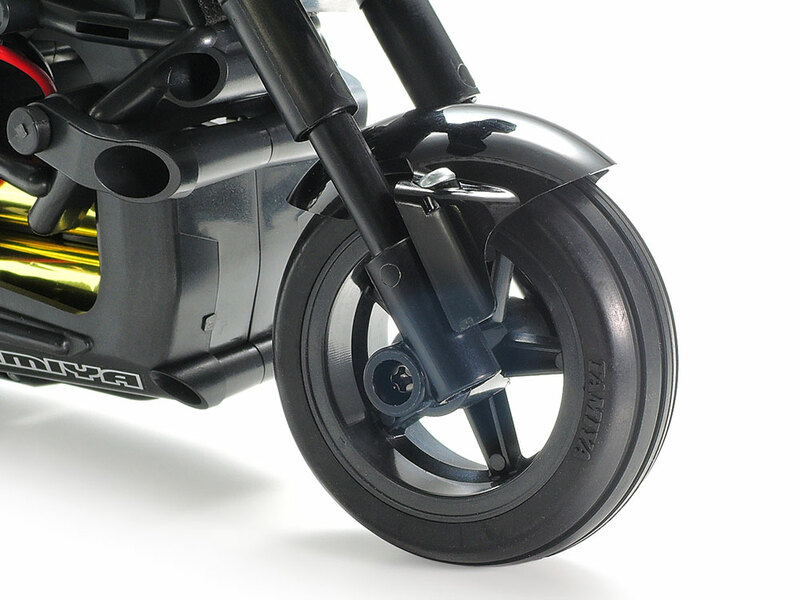 ★An internal spring built in to the front fork gives the Dual Rider great stability, even at low speeds. 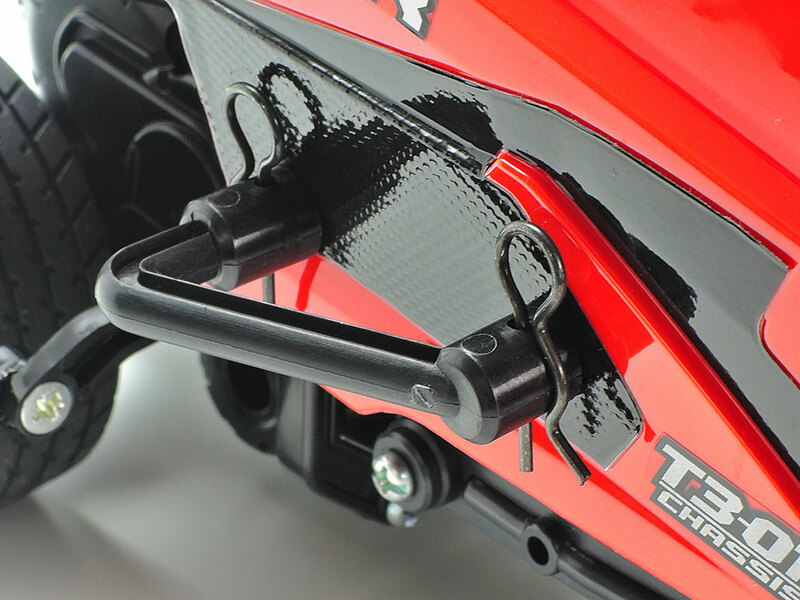 ★A close-up on the telescopic front fork suspension, which gives the model a realistic ride. 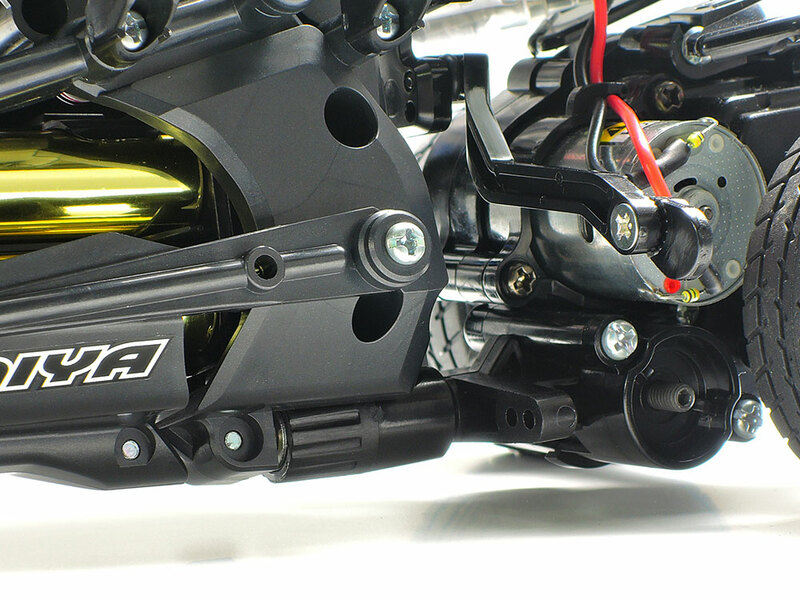 ★Cornering lean is achieved by the servo acting on the cam slide suspension-fitted rear section. 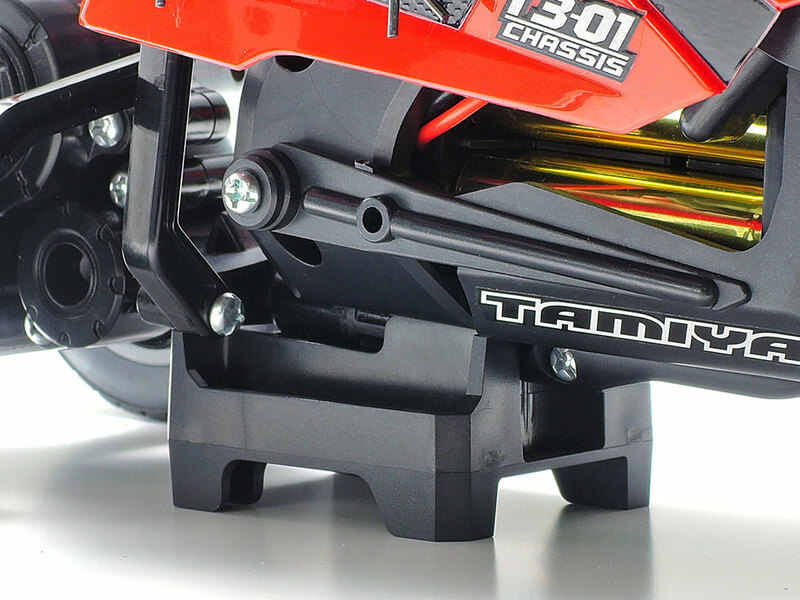 ★Support arms move in concert with the steering servo, and aid the model in righting itself. 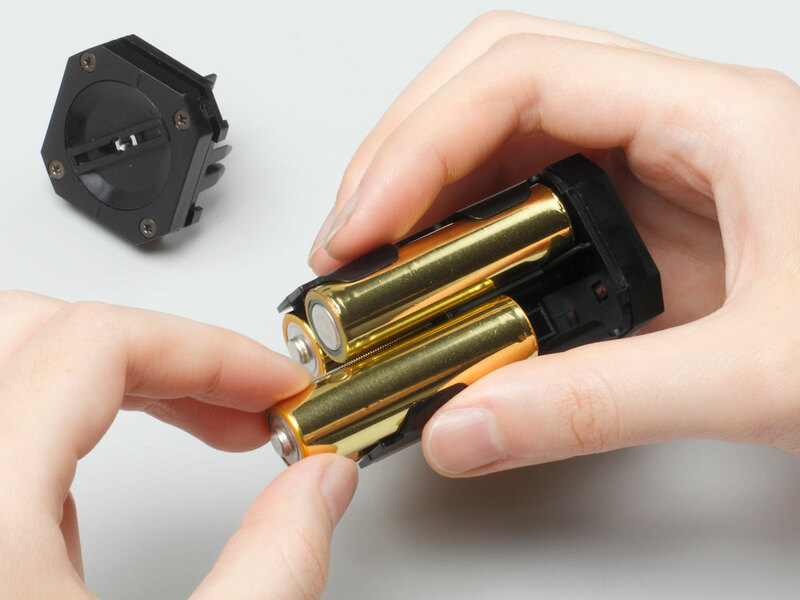 ★Case for R6/AA/UM3 batteries is included in the Japan spec version of the kit only. 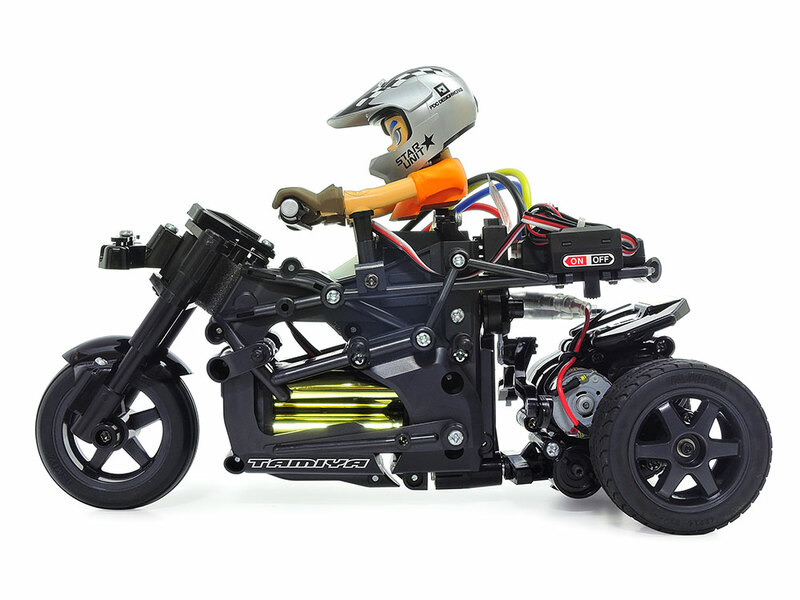 ★Left: Model is compatible not only with R6/AA/UM3 batteries, but also Tamiya LF Battery LF1100-6.6V Racing Pack. 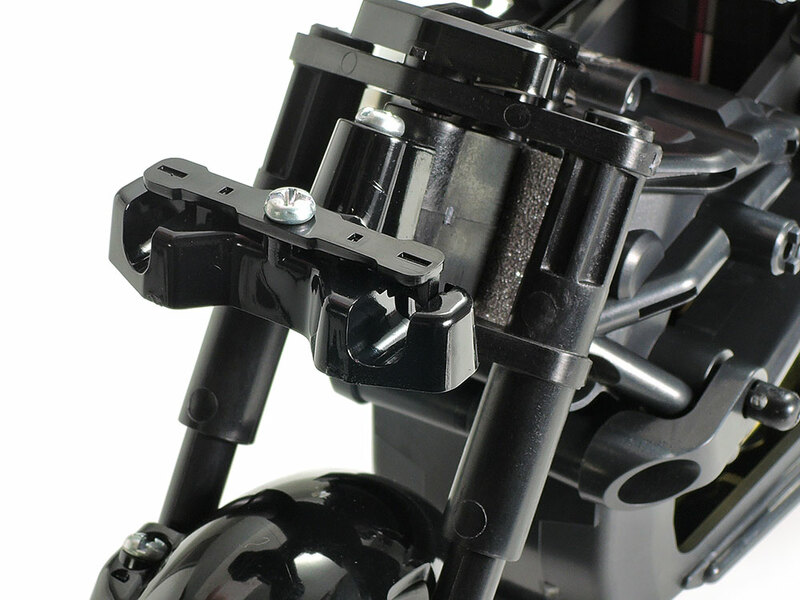 ★Right: Side guards both protect the body during crashes and hold it in place with the chassis. ★Left: This handy stand can be used both when displaying the model and during the construction process. Information is correct as of April 3, 2019. Specifications are subject to change without notice.